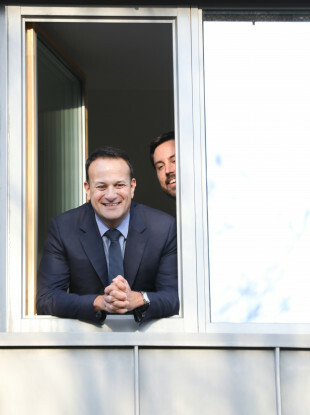 TAOISEACH LEO VARADKAR has said his party can “look proudly to its record and the many steps we have taken to build a state that cares and in particular one that cares for families”. Addressing his party members at the Fine Gael Ard Fheis this evening, Varadkar said Fine Gael is a “compassionate party” that throughout history believed that “the State has a role in offering a helping hand to those that need it”. Unlike last year’s speech, which made three references to housing issues, with one mention stating that the party is determined to “solving the housing crisis”, there were no mentions of it this evening. The number of children living in emergency accommodation in Ireland rose by 136 last month. Emergency accommodation figures for September show that there are now collectively 9,698 people living in homeless accommodation across Ireland. The number of homeless children in Ireland is now 3,829. While there has been a rise in the number of children presenting as homeless, the Department of Housing noted that the number of new families entering emergency accommodation is down from last month. Overall in September, 88 families entered emergency accommodation in Dublin, while 45 exited. The Oireachtas Housing Committee was recently told that the recategorisation of homeless figures has “undermined confidence in the data”. During his speech, Varadkar said each generation must answer a different question about the future of our country. “One hundred years ago it was how to win our country its freedom and to survive as an independent state in a hostile world. “Sixty years ago it was how to develop enterprise and industry so that we could provide opportunities for all and end the scourge of forced migration. Ten years ago it was about restoring our good name, international reputation, confidence in our economic and political system, so that people had hope again for the future of this country. Once again, able to believe that this year will be better than last and that their children will have more opportunities and a better life than they have. The Taoiseach stated that Fine Gael are reducing the barriers faced by many mothers working outside the home, listing off the two years of free pre-school, subsidised childcare, and longer maternity leave and paid paternity leave. We recognise that all these things made it easier for people to advance. They help women and men, and reflect our idea of what a 21st century society should look like. Today we face challenges, just as great as any which went before. There will always be new challenges, there will always be more work to be done. The Taoiseach also touched on the issue of Brexit, and also on who they extended invites to this evening. We also invited the parties from Northern Ireland to this gathering. We weren’t sure whether we should invite Fianna Fáil. To be honest, they weren’t sure either! In terms of Brexit, he said it is not Ireland’s policy. “The best case scenario for Ireland would be for the United Kingdom as a whole to remain in the European Union, in the Single Market and Customs Union. However, the British people and parliament have decided against this. So, it has been our priority to defend our interests – to minimise the harm to Ireland and maximise the opportunities, however few. He said the draft Withdrawal Agreement and protocol of Ireland negotiated this week protects the peace, avoids a hard border between North and South, retains the common travel area between Britain and Ireland, while also ensuring there are no tariffs or quotas between us and that customs checks are minimal. “It translates faithfully, into a legally binding document, all that was agreed last December,” he said, adding that while it hasn’t been easy, the UK Government and the UK Prime Minister Theresa May have been “true to their word and now we commit to working closely with them to build a new and special bilateral relationship with them”. Email “Varadkar says FG can look proudly to its record in 'caring for families'”. Feedback on “Varadkar says FG can look proudly to its record in 'caring for families'”.